Valuable weapons are now 'unidentified', and might be cursed! Beware! Many high-end weapons received as drops from random NPC's and random chests are now unidentified, denoted by a "?" on their name. When you equip an unidentified weapon, it has a chance of being cursed. A cursed weapon can't be unequipped normally, and you'll need to find a healer, shrine, or special scroll to remove the curse. Any weapons dropped by Dremoras or Golden Saints will be unidentified. I did this by replacing the contents of their leveled lists, rather than editing the creatures themselves. To remove a curse, you can find a Healer NPC and pay them 400 gold (they'll refuse to do business with vampires, however), go to a shrine and pay 500 gold, or find or purchase a Scroll of Remove Curse. Shrines and scrolls wont discriminate against vampires, but the holy magic will burn on the way down. Ultimately this mod serves to address 2 major issues with Morrowind's end-game economy: Random enemies drop ultra-valuable daedric and ebony gear like halloween candy, and there's really nothing to spend all your money on. By making players more apprehensive about checking whether or not something is cursed, and making cursed items worthless, we can keep a high-level player's income relatively in check. Getting curses cured probably wont be a money sink capable of fixing the economy by itself, but any money sink helps. 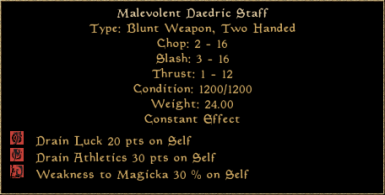 In addition, daedric weapons have a very small chance of being a rare "good cursed" weapon. 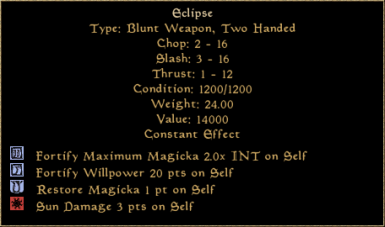 These weapons are still cursed and cannot be unequipped, and usually still come with some downside, but also have beneficial enchantments that might make them highly desirable. Sixth House Bell Hammers are also unidentified now. I did this by modifying the original version of the weapon rather than creating a new "unid" version, so that I wouldn't have to go to every cell where they're hand-placed and potential cause conflicts. The only cases in which I modified a cell was to add a Scroll of Remove Curse for a vendor to sell. Future versions may replace hand-placed weapons with unidentified versions. - Unidentified shields for Golden Saints. - Unidentified armor for Ordinators and High Ordinators. - Unidentified weapons held by other NPCs. - Unidentified items strewn throughout the world outside of levelled lists. - Expansion into Tamriel Rebuilt content. - Means of identifying unidentified gear without having to equip it and risk getting cursed. - Creating a "no conflict" version that doesn't rely on the presence of the Remove Curse effect. This would require scripting the scrolls, which makes them non-stackable, so I'd rather make it a separate version. If you find any bugs or conflicts with any major mods, please let me know and I'll build a workaround. - This mod utilizes the unused "Remove Curse" effect, and will conflict heavily with any other mod that does. - I've modified a handful of NPCs (currently just ordinators and high ordinators), changing their inventory so they carry unidentified weapons. To minimize conflicts, please load "HVH - Curses.esp" before any other mod that changes these NPCs. - Using a hotkey to try to equip a lockpick while holding a cursed weapon freezes the game. This may just be a problem with my install, because I've had lockpick-related freezes in the past, and I didn't test this out on a clean install. Please let me know if you do or do not experience this problem.